Juanita Dominguez is a Spanish-speaking mom to three daughters, ranging in age from 3 to 17. Erika, her middle child, has spina bifida with secondary hydrocephalus. The main expression of this condition for Erika is that she cannot feel her legs and cannot walk, so she uses a wheelchair to get around. At age 9, Erika is beginning to get a bit heavy for her mother to pick up on a regular basis, which meant that getting in and out of their family van was becoming increasingly difficult. Without a wheelchair ramp, Juanita had to lift Erika from her chair into the van, and back out again, any time they wanted to go somewhere. 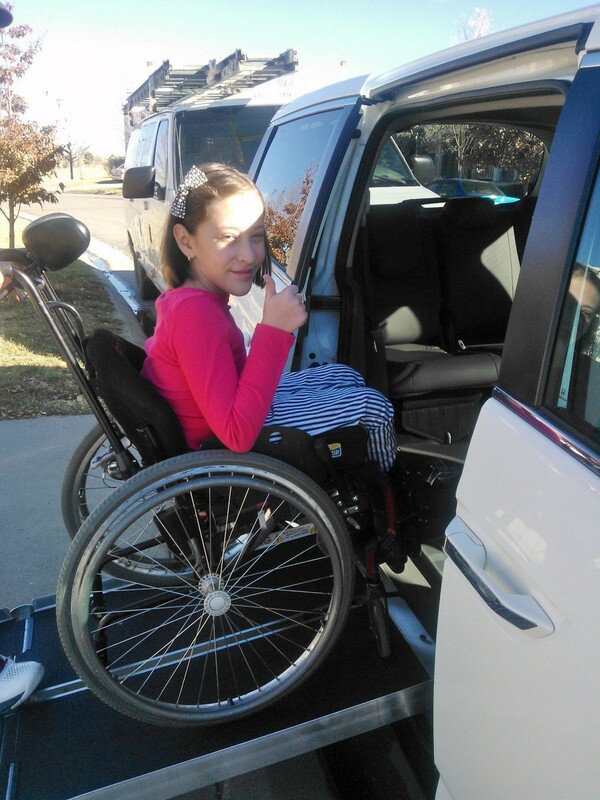 So they began asking the health care providers and others in the community how they might be able to get a ramp installed, allowing Erika to roll right up and into the van in her chair. The first referral to a foundation that considers funding requests like this resulted in a dead end: to qualify, applicants need a driver’s license and a social security card, which was not possible for the Dominguez family. Fortunately, a staff member in the Special Care Clinic at Children’s Hospital Colorado referred Juanita to Family Voices Colorado, and the family got connected with Ileana Perez, one of our bilingual Family Navigators. Ileana was able to direct the Dominguez family to Variety Colorado, a children’s charity that seeks “to provide life-saving and life-enriching assistance to children challenged by physical and mental disabilities, poverty, abuse and neglect.” Ileana helped Juanita apply for the funding of a wheelchair ramp for their van, and within a relatively short period of time, Variety Colorado approved the application, granting the family $1900 in total, plus a $200 gift card. While grants fund much of Family Voices Colorado’s work, we increasingly rely on individual donations to help us fulfill our mission to increase access to and quality of health care for children and youth with special health care needs. Please consider supporting Family Voices on Colorado Gives Day, Tuesday, December 10, to help us continue making Colorado a better place for all families! Family Voices National is partnering with Genetic Alliance and Parent to Parent USA (P2P) to collect resources that will support individuals who wish to act as advocates on behalf of themselves, their families, or others living with the same condition. To date, we have collected over 240 resources that will help users build leadership, communications, outreach, and advocacy skills. The tools will be part of an accessible online toolkit, with advocacy resources grouped by topic area. We would like to include a personal story that demonstrates the importance of advocacy from an individual, family member, or caregiver in each of the toolkit topic areas. For this project, ‘advocacy’ can include any example of a time when you or your family communicated a need, shared your story, or took steps to get something you wanted or needed. Do you have a story to share about advocating in one of the following areas? To have your story included in the advocacy toolkit for individuals and families, please send a 1- to 3-paragraph summary to Sharon Romelczyk, Program Manager at sromelczyk@geneticalliance.org. Please only include information you wish to be shared, including any and all names or other identifying information. If we include your story on the toolkit, we will contact you to let you know your story has been selected. Please let us know if you have any questions about the stories, how they will be used for the toolkit, or the toolkit in general. Thanks!